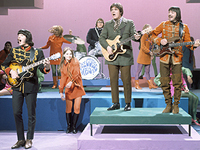 “American Woman” is the title track of Canadian band The Guess Who‘s 1970 album, American Woman. The song’s origins took the form of a live jam in Kitchener, Ontario. The group was rushing into the second set and began improvising a rhythm to liven up the crowd. Burton Cummings, the lead singer, began improvising lyrics to fit the music. Randy Bachman has claimed that the American woman referred to in the song is in fact the Statue of Liberty, furthering the anti-war theme. As a single, the track spent three weeks at the top of the Billboard Hot 100 (where it was credited as a double sided hit, along with “No Sugar Tonight”), an unprecedented success for a Canadian band; at the time, it competed with singles such as The Jackson 5′s “ABC” and The Beatles‘s “Let it Be”. “American Woman” was voted Best Canadian Single of All Time by Chart Magazine in both the 2000 and 2005 polls of readers, music industry professionals, and musicians throughout Canada.